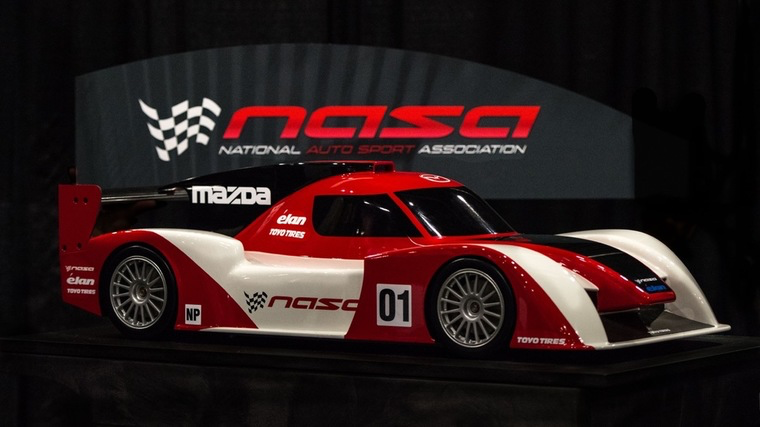 Indianapolis, IN —The National Auto Sport Association (NASA) unveiled today during the PRI Show an exciting new prototype series that will be called the NASA Prototype series (NP). The NP series will debut in fall of 2015. The NP series is a collaborative effort between NASA and Élan Technologies that will feature an all-new affordable prototype racing car called the NP01. The goal of the NP series is to give rise to the most affordable prototype class ever created. In an effort to provide the high performance and competitive, yet affordable prototype racer, NASA partnered with Élan Technologies to design and construct the NP01. Élan will build each NP01 to order and ship them either as an easily assembled kit or completed vehicle per the customer’s request. The NP01 will be unlike anything currently available in motor racing. With an introductory complete kit price of just $59,995, the affordable new prototype will feature a closed cockpit design for increased driver protection. No word yet on a turn key option yet, as it will depend heavily on spec and livery options. The NP01 will weigh in at just 1550 Lbs. and boast an estimated top speed of 155mph. The NP01 will be powered by a sealed 185-horsepower, 2-liter Mazda power plant mated to a 6-speed sequential transmission. Ryan Flaherty, NASA National Chairman, says “The NP Series will feature a brand new spec prototype chassis designed specifically around the goals that make NASA competition so attractive to competitors – easy access to local racing with the chance to compete for a season ending class championship." “Toyo Tires and NASA have enjoyed a long and successful partnership, and we are excited to work closely with the talented team at Élan Technologies on this new endeavor,” said Marc Sanzenbacher, senior manager, Competition Performance Products Division, Toyo Tire U.S.A. Corp. The National Auto Sport Association (NASA) was formed in 1991 with the premise of delivering high-quality motorsports events to enthusiasts at major racing venues throughout the nation. NASA has created programs that allow owners of both racecars and high-performance street-driven vehicles to enjoy the full performance capabilities of their cars in a controlled professionally managed environment. NASA offers many different programs that will allow you to enjoy motorsports on a number of different levels, including our High Performance Driving Events (HPDE), Rally Sport, Time Trial, NASA-X and Competition Racing programs. For more information, log onto www.nasaproracing.com and connect with the community at Facebook, Twitter, and Google+.